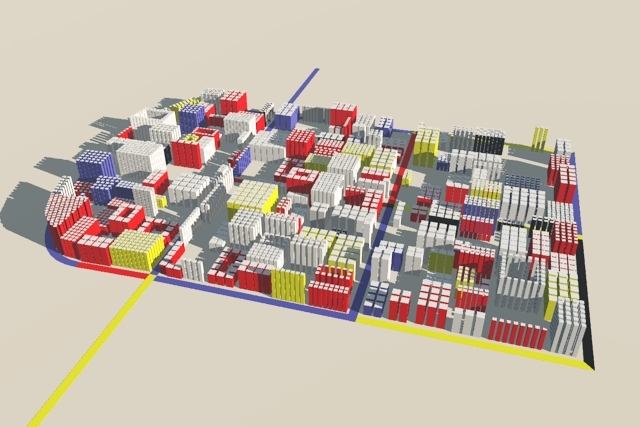 Here are two quick Vue 9 renders of work in progress models made with CityEngine 2010.3 Indie. Since I got CityEngine in November I’ve been tinkering with it working on trying to get to grips with its CGA language and make some semi realistic models. Yesterday, after coming across some photographs of architectural models of Soviet Constructivist building schemes, I decided to see if I could get CityEngine to generate similar looking models. So far I’ve got a seven different lot layouts and a simple square tower building. 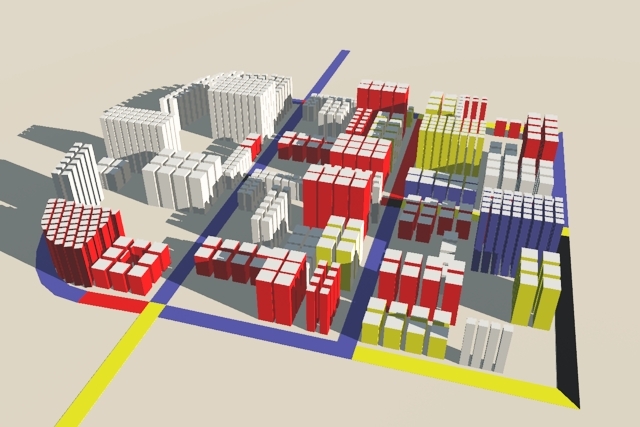 The colours used for the buildings on a lot are uniform and selected randomly from a set of predefined combinations. I want to add a couple more simple building types (rectangle, cylinder, large H, large L and large O). I also want to drive the road colours with a colour map so they can become bold lines running through the images. Overall though for maybe five hours gentle effort I’m pleased with the progress so far. The first model is made with a simple road network with the rules applied to it. The second model was made with the same simple road network scaled so there were more lots with the same rules applied to it. Its not that I'm having problems but CityEngine is a tool just like Poser, Vue or 3DS Max. If a suitable set of CGA files and textures is available its a magic wand but if you want to make something unique it will take time just like any tool. Also like any tool it will take time to learn with Christmas and other things I've had less than a month of evenings and weekend to start to learn it. Fortunately Procedural have several example projects (Medieval town, future city, Paris etc) that are available but what I've set out to build for my project can't be based on one of those so I've got to make all the textures, devise all the buildings from scratch. Its not so much that that is difficult as that to do it right will take time. The last thing I want to do is post something that makes me or CityEngine look bad. I posted a quick WiP here a couple of years ago of a Vue render and someone who thought they were an uber render / illustrator wrote a massive comment tearing it to pieces. Since then I post far fewer renders especially when I'm just learning something. The CGA language is also not like the ones I work with day to day so I've got to learn it from scratch. The basic structure is straightforward but I'm still having to check details as I go. You can work with it with the node view but I've not really tried that method yet - I suspect it will suit many users better especially those used to things like Vue's material editor. As a coder I tend to find coding easier than node views. I suspect that over time some users will learn to code CGA and sell/give away their project files to others who use/cofigure them with their own street layouts, terrains, obstacles maps, attribute maps etc. In a way its just like some users modeling and riging figures and others just using Poser. So don't give up hope. I should be posting a full review of it soon so hopefully that will explain things better. ok waiting! I know that it is doable because for some time an example something like that was shown on their site. So how difficult can it be? If even you have problem it doesn't tell well for their product. How can ordinary users cope? Or, an Italian country village will also do! Nice, but since you are the technology expert on programming Vue we look forward to a complete realistic looking Greek/Roman village preferably something which we can buy/download and tinker with..